Watkins Fence is your premier Central Coast’s fence design and installation company providing quality products and services at competitive prices. 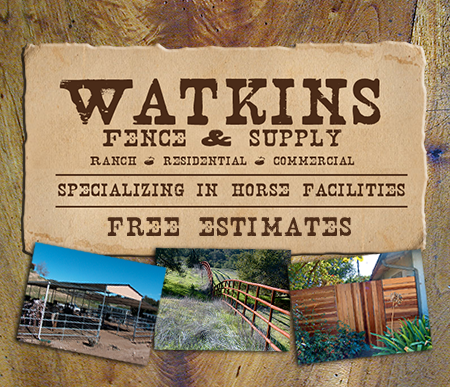 Specializing in horse facilities, we install all kinds of fences from ranch rail, oil pipe, vinyl and chainlink, to electric and barbed wire. Our horse corrals are built to the highest standards in the industry. All jobs, large or small, receive the same amount of consideration and attention to detail. Our cumulative fence experience is unmatched. Our estimators, installers, quality control division, service crews and staff have worked closely on fencing projects for over 15 years. Feel free to contact us with specific questions about the materials we carry, sell and install, as well as the services we provide.